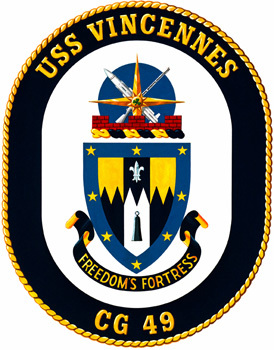 This patch is manufactured by the ORIGINAL supplier of the crest patch as sold in the USS Vincennes ship's store. The material quality, design, details and coloration are of the same standards as the original. The patch measures 5-inches in height and 3.5-inches in width. If you want to send us a check, please contact us for details. Copyright ©2000-2008 all rights reserved.